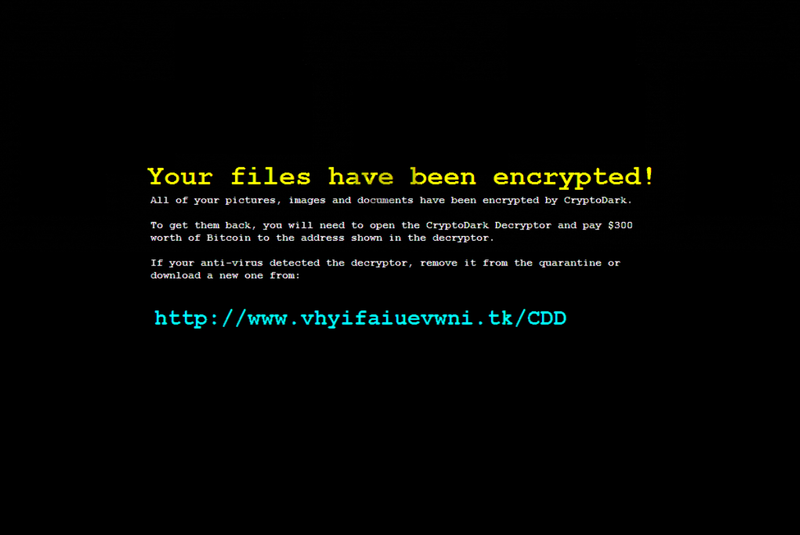 Cryptodark Ransomware is a serious computer infection seeking to obtain money from users. Although it also demands a ransom after the successful entrance, it is not a typical ransomware-type infection. As specialists at pcthreat.com have observed, it does not lock any files even though it claims that it does so. Instead of locking pictures, videos, music, and other personal files like other ransomware-type infections analyzed previously by our researchers, it sets a new wallpaper and places a window with a ransom note on Desktop. Because of its presence, many inexperienced users believe that their files have all been locked, but it is not true. It means that there is no point in transferring money to cyber criminals behind this ransomware infection either. You can see for yourself that your files are fine by removing the window opened by Cryptodark Ransomware – restart your computer or right-click on the icon on Taskbar and select Close Window from the drop-down menu. Sending money to cyber crooks is not recommended also because users encourage them to continue developing malicious applications by giving them what they want. What we recommend doing instead is removing the ransomware infection fully from the system. The sooner it is gone, the sooner you could use your PC without fear of discovering encrypted files. Yes, theoretically, this threat might be updated one day and lock your files, so its removal should be a top priority. Specialists working at pcthreat.com cannot call Cryptodark Ransomware a typical ransomware infection because the version analyzed does not lock files, does not drop files with ransom notes, and does not make serious changes on users’ computers. Following the successful entrance, it changes Desktop wallpaper and places a window on Desktop. They both try to convince users that their files have been locked, which is a complete lie. Also, users are told that they could get their files back only if they send a ransom of $300 to cyber criminals. Transferring them money is the worst you can do because there is a 99% possibility that you do not need the decryption key. Also, you can easily change your wallpaper and remove the window from Desktop. You should not pay money to developers of ransomware infections even if you ever find your files locked because, in most cases, they give nothing to users. To put it differently, you will be left both without files and money in this case. Ransomware infections are one of the sneakiest threats, so it is not at all surprising that Cryptodark Ransomware has also managed to enter your system without permission. Although specialists do not know much about its distribution yet, they are sure that deceptive distribution methods are used to spread it. For example, it is very likely that it might travel as an attachment in spam emails. Also, careless users can get it from third-party pages without even realizing that, specialists say. This threat might be disguised as a useful program, so its infection rate might increase rapidly. It is not the only computer infection spread using these two distribution methods, so you might allow a new ransomware-type infection to enter your PC once again if you do not do anything to protect your computer from malware. You do not need to do much to ensure your system’s maximum protection – the installation of a reputable security tool would be enough. Cryptodark Ransomware sets a new wallpaper, opens a window on Desktop, and creates four new files (1.CRYPTODARK , 2.CRYPTODARK , CryptoDark Decryptor.lnk, and CRYPTODARKBACKGROUND.BMP) after the successful entrance, so we would lie if we said that it is a piece of cake to remove this infection from the system. Luckily, it is not one of these infections that create a bunch of new registry keys in the system registry, block Task Manager and other utilities, or lock the screen, so you should still manage to delete it manually from your PC. If you need some help with that, follow our step-by-step manual removal guide located below this article. Scanning the system with an automated scanner fully is another method to erase this infection – adopt it if you find the manual method too complicated. With its help, you will take care of all other active infections without putting much effort into this. Restart your computer to remove a window with a ransom note from Desktop. Press Win+R after the restart, type regedit, and click OK.
Right-click on it and select Modify from the menu. Locate the Value data field and empty it. Tap Win+E and open %USERPROFILE%\Desktop (type it in the address bar and press Enter). Right-click on the file CRYPTODARKBACKGROUND.BMP and select Open file location. Remove four files: 1.CRYPTODARK, 2.CRYPTODARK, CryptoDark Decryptor.lnk, and CRYPTODARKBACKGROUND.BMP from %USERPROFILE%\Desktop. Quick & tested solution for Cryptodark Ransomware removal.